Post-war verse for a year's end by Ida Randolph Spragge, wife of Maclean's editor Thomas B. Costain, from the magazine's January 1919 issue. The Lord awaits your presence here." But yet triumphant, knelt to Him. And freedom, bound, find swift release. I love and deep humanity. The earth game thanks to Thee on high. In love and deep humanity." Twenty-eighteen was a year of great change. In April, we sold our home of ten years and started packing up our belongings. We moved in early July, settling several hundred kilometres to the northeast. The books that once surrounded now lie boxed in the dark basement of the house we're renting on the banks of the Rideau Canal. 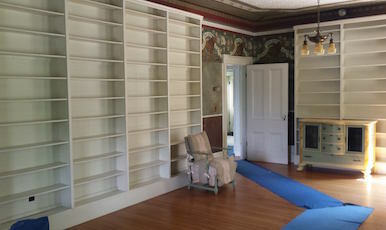 Living in a house without bookshelves is disorienting. Where I once knew where everything was, passing by the same books day after day, month after month, year after year, I now spend hours hunting. This past summer I bought a copy of James M. Cain's Serenade because I wanted to reread it. There's a copy in the basement... but where? I purchased fewer books this year. Why add to the confusion? This annual list of ten best buys – best acquisitions, really – was made strong through the generosity of friends. 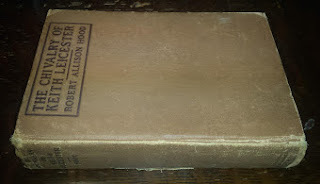 "A NEW EDITION" of Allen's first novel, published two years after his early death, this copy is well travelled. It began life in a Boots Booklovers Library, and somehow made its way to a British Columbia bookseller's shop. The book now sits on my desk, one hundred or so kilometres from Allen's birthplace. This birthday gift from my friend James Calhoun is the only biography of Joe Boyle. An extraordinary man, had Boyle been born south of the border, there would've been a movie and and a two-part American Experience documentary. We Canadians are so bad at these things. 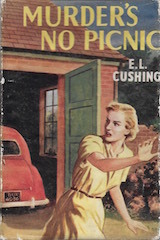 The first and only English edition of Cushing's 1953 debut novel, it vies Margerie Bonner's The Shapes That Creep as the worst mystery read this year. And yet my research into this forgotten Montreal mystery writer continues. A curious romance about a closeted, corseted, petticoated poet and his masculine twin sister, written by an unsuccessful mystery writer in collaboration with a Science Fiction and Fantasy Hall of Fame member. Need I say more? After years searching for the great – only? 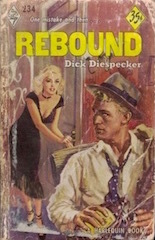 – Vancouver post-war pulp, I asked my friend bowdler of Fly-By-Night if he might have a spare copy. He did... and gave it to me as a gift. It didn't quite live up to expectations... but that cover! 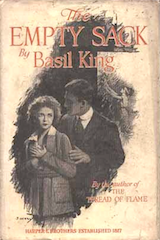 Reviewing Basil King's The Empty Sack here last month, I wondered whether it might just be the Great Canadian Post-Great War Novel. 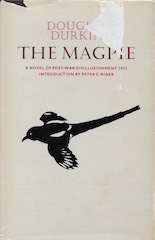 Beau not only suggested The Magpie, but gave me a copy. To be read after the holidays. 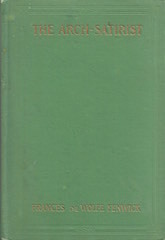 A first novel by a journalist and elocutionist who once served as secretary to fellow novelist Sir Andrew Macphail. 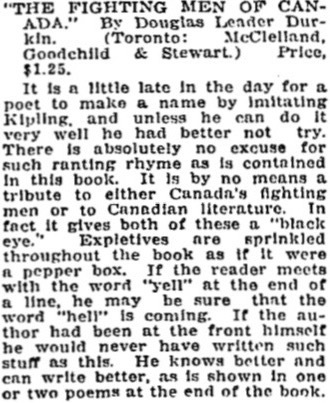 Described as a "clever novel" in the April 1910 Canadian Bookman. 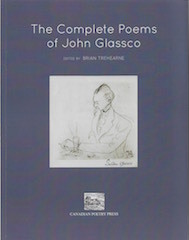 A gift from Brian Treherne, who worked for over a decade editing this monumental work. Invaluable to any Glassco scholar. 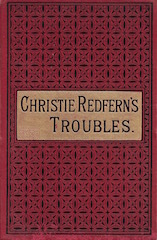 The most popular novel ever written by an instructress of the Sherbrooke Ladies' Academy, Sherbrooke, Canada East. Despite its commercial success, used copies are uncommon. 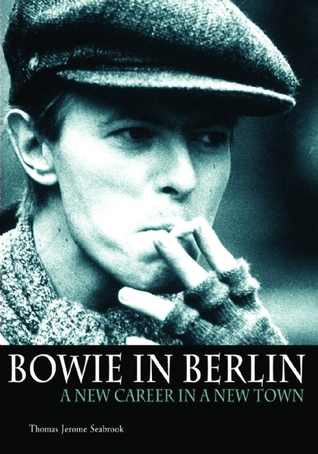 I was fortunate in spotting this one being offered online from a UK bookseller. 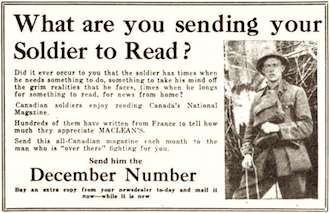 The Great Canadian Post-Great War Novel? Verse for the day by Virna Sheard (née Stanton), daughter of Cobourg, Ontario, from her collection The Miracle and Other Poems (Toronto: Dent, 1913). The first novel the reverend wrote after the Armistice, this is the story of a man who, suffering from shell shock, loses his identity and memory. Essential reading for anyone studying the depiction of PTSD in literature. 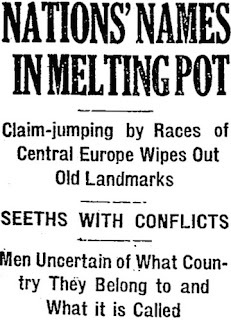 A tale of two families, both trying to make sense of the post-Great War world. Murder features, rather unexpectedly. I dare not spoil, but I have reason to think that it influenced Ben Hecht's The Front Page. 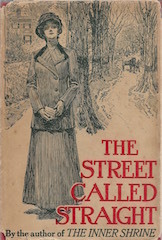 The last of five novels penned by a woman known more commonly as Isabel Ecclestone Mackay, its depiction of failed promise and domestic abuse had me wondering how it is that she is so forgotten. It's rare that I let a year go by without tacking a Grant Allen novel. 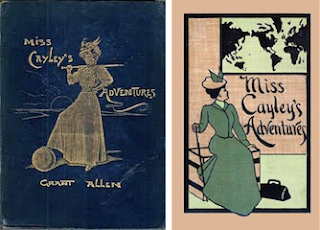 Miss Cayley's Adventures is one of the most popular, but not with me. Oh, I liked it well enough... but there are much better. In the midst of reading the novel I posted a list of my ten favourite Grant Allen novels. Revising that list, I would place Miss Cayley's Adventures at number eight, between The British Barbarians and Recalled to Life. What fun! Last year, Robert Barr's Revenge! made my list of three books most deserving of a reprint. 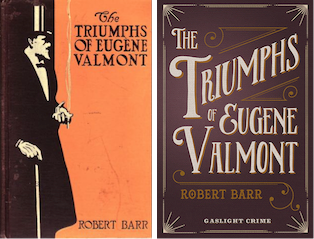 The Triumphs of Eugène Valmont would've been a shoe-in for this year had it not been available from the good folks at Gaslight Crime of Harpenden, Herts. 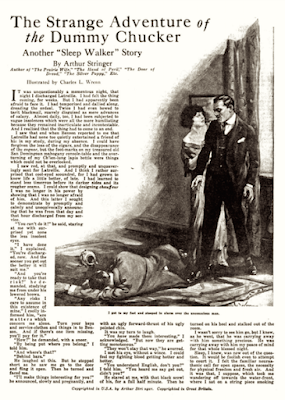 Their edition features "The Adventures of Sherlaw Kombs" and "The Adventure of the Second Swag," two Sherlock Holmes parodies not included in the original. The most entertaining read this year. The Invisible Worm, Margaret Millar's 1941 debut had been long beyond both my financial reach and that of Ontario's interlibrary loan system. At long last, I was able to read it thanks to Syndicate Books' Collected Millar. 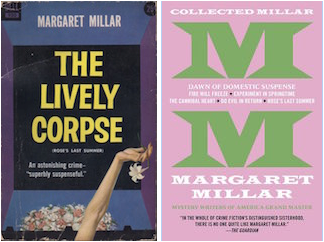 Or is it called The Complete Margaret Millar? Either way, I'm appreciative. Collectors should take note that a copy of the first UK edition (above left), published in 1943 by John Long, is still available from Dacobra Books, Belleville, NSW, Australia. Price: US$520. The Lively Corpse is Rose's Last Summer under another name. 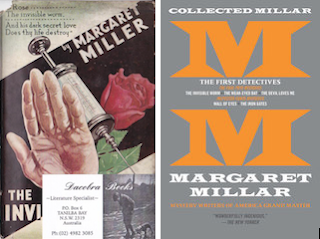 Margaret Millar's tenth novel, it closes The Dawn of Domestic Suspense, the second volume in the Collected Millar. 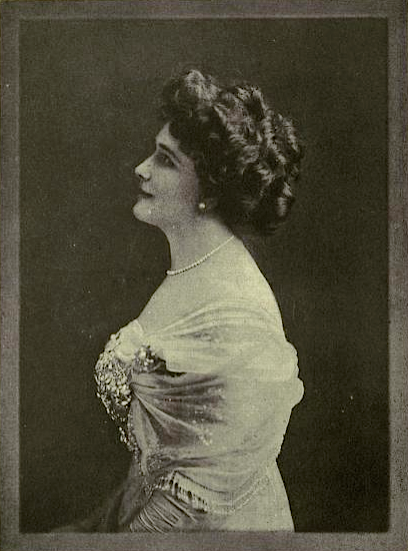 The third volume is titled The Master at Her Zenith. This is Millar ascending. 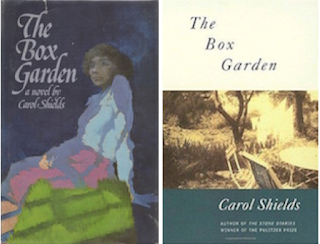 The author's second novel, The Box Garden was published fifteen years before The Stone Diaries made her a household name. I'm embarrassed to admit – yet I must admit – that it is the only Carol Shields novel I've ever read. On the other hand, does her work really have a place in a blog devoted to forgotten, neglected, and suppressed writing? This year I was involved in returning John Buell's Four Days to print. 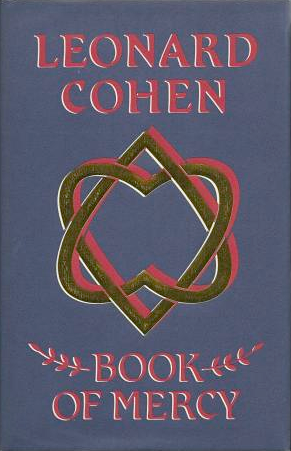 The author's second novel, it isn't so well known as his debut, The Pyx, but I think it is his best (and here I acknowledge that I haven't yet read his 1976 novel Playground). A Ricochet Book from Véhicule Press, the new edition features an introduction by Trevor Ferguson (aka John Farrow). 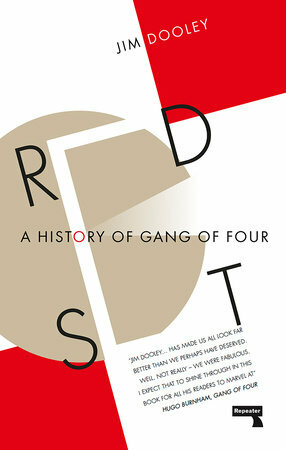 I didn't publish a book this year, but did contribute a few photos, ticket stubs, and a handbill to my friend Jim Dooley's Red Set: A History of Gang of Four. This is what comes from being a pack rat. 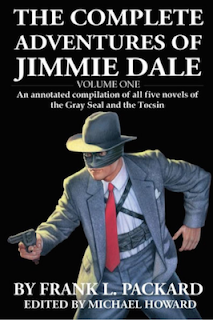 Praise this year goes to American Frank L. Packard scholar Michael Howard, who has begun reissuing the Jimmie Dale/Grey Seal novels in annotated editions. The next, featuring The Further Adventures of Jimmie Dale and Jimmie Dale and the Phantom Clue, will be released in the New Year. True labours of love, they can be purchased through American online booksellers. I resolved last year to read more books by women. And I did! Eleven of the twenty-five I reviewed were by women writers. Let's see if I can't improve on that number. I resolved last year to read more books by French language writers... and failed miserably. What I'd thought was an all-time low in 2017 – one! – was surpassed with a zero count in 2018. I hang my head in shame. I resolve to finish one of the two books I'm currently writing. Finally, as always, I resolve to continue kicking against the pricks. The Austro-Hungarian Empire is gone... and so too is "The Season's Best Books in Review," the Globe's annual gathering of the year's finest titles. I was a fan of the latter (not the former), writing about it here, here, and here. 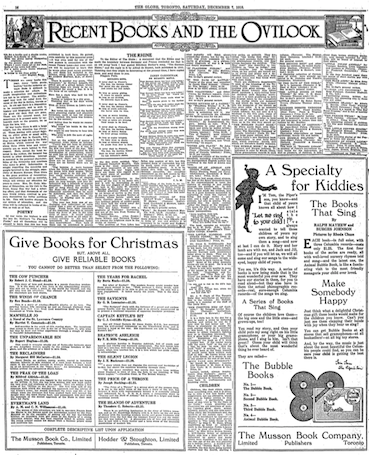 "Recent Books and the Outlook," the successor to "The Season's Best Books in Review," made its debut in that same December edition of the Globe. 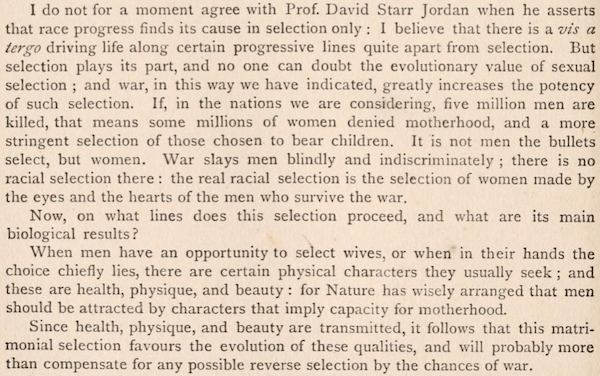 Though similar in appearance and length – five pages – there is a marked difference in tone, as evidenced in this early dig at our tardy allies to the south: "Of war books there is still a large output, but the situation has changed. Those dealing with actual fighting, on either great or small scale, have had their day in Canada, but they are still at high tide in the United States, which entered the war about three years later and consequently are so much behind in that respect." 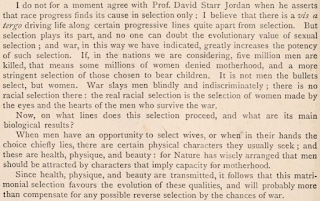 A second dig follows from someone described only as a "competent critic," who notes that war verse hasn't nearly so plentiful as in previous years: "War became a mere business when the United States entered into the arena with their slogan, 'We've got four years to do this job.' No poet could become enthused over a job. This cessation of singing was inevitable, for the war had gone on long enough and had deteriorated into a debauch of mutual slaughter." 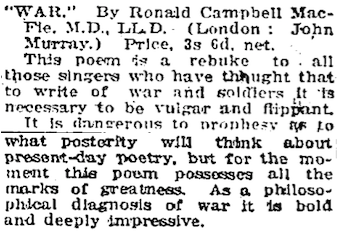 Canadian Poems of he Great War - John W. Garvin, ed. In the Day of Battle (revised) - Carrie Ellefscottn Holman, ed. "Special attention should be paid by all lovers of poetry to the work of the late Lieut. Bernard Trotter of Toronto," writes the competent critic. 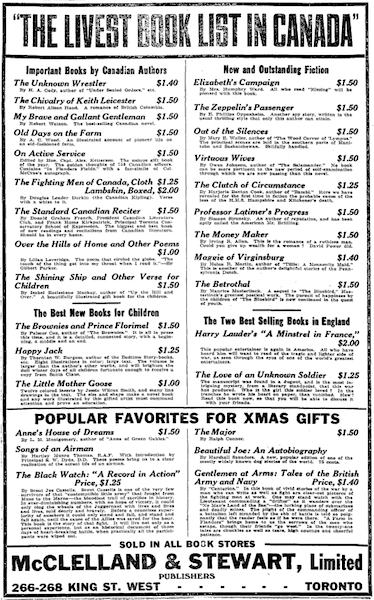 This may explain how it is that Trotter's book, published in in 1917 and praised in that year's "Season's Best Books in Review," holds a spot in this 1918 list. Nevertheless, this review is something new. "The Season's Best Books in Review" was all about the Best Books, but here the Globe is including what its critic thinks is one of the worst. 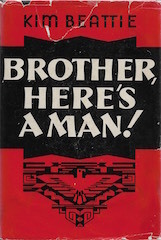 Of the 179 books cover in "Recent Books and the Outlook," not one is given nearly so savage a beating as The Fighting Men of Canada. No word of explanation is given for the inclusion of Marshall Saunders' 1897 novel Beautiful Joe. You'll note that Norman Duncan weighs in with two titles, despite being two years dead. Not exactly a glowing recommendation. Ah, hell, I didn't think all that much of it either. The problem of Vers Libre has fallen into neglect of late, but this mongrel form of expression has left its mark upon even some of our most orthodox poets. It is to be hoped that with the cessation of German atrocities, the atrocities committed on the fair muses by the super-vers-librists will go to the junk-heap of junkerdom. He'd have been grumpier still had he known what the post-war would bring. 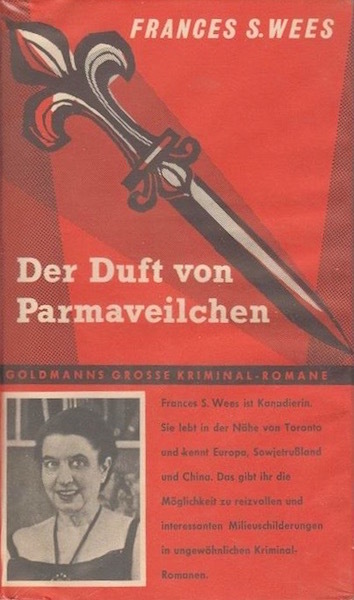 When buying this book I chose to ignore several significant clues: This Necessary Murder is the only Frances Shelley Wees novel that did not attract a North American publisher. 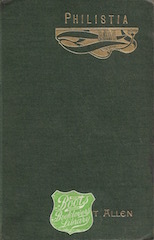 The Jenkins edition was limited to a single printing. There has never been a paperback. Before reading those words, I'd hoped This Necessary Murder might make it as a Ricochet Book, the Véhicule Press imprint for which I serve as series editor. I'd liked the author's previous mystery, The Keys of My Prison, going to far as to liken it to the domestic suspense and psychological dramas of the great Margaret Millar. 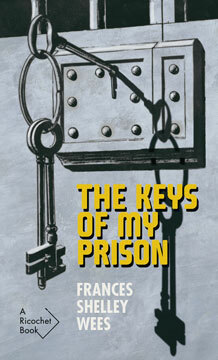 Ten months after reading the novel, The Keys of My Prison was back in print as a Ricochet Book. This Necessary Murder isn't nearly so strong a work, but it's also not quite as awful as its publishing history and opening scene suggest. Our young Jyne or Jane (we never do encounter Patch the gardener) is twenty-four years old. A single woman of indeterminate means, she lives with and dotes on her much older bachelor brother, renowned specialist in criminal psychology Doctor Jonathan Merrill. Dutiful Police Constable Henry Lake, “Jonathan’s extra right arm,” also lives in the ancient Toronto house, though this is a temporary arrangement. Read nothing into Jonathan’s bachelorhood. Backstory informs that the doctor has recently put his skills to use in taking down the notorious Barnes Gang, and was shot through the shoulder for his efforts. Now, with leader Jed Barnes and the rest of his gang locked away in the Don Jail, the threat posed to the small Merrill household appears over. Henry Lake stays on only to care for Jonathan as he recovers from his shoulder wound. You know, instead of a nurse or Jane or Patch the gardener. We need Jon in Tressady just now. We have an odd little problem… an emotional business, nothing more. I wish Jon could come but I don’t dare write him. It’s only a small storm in a Wedgwood teacup, but there are possibilities of the sort of unpleasant gossip and long-term suspicions that are bad for a small town. “Not long, I think,” Jonathan said quietly. Again, justice is swift in This Necessary Murder; investigation, on the other hand, moves at the pace of a particularly fat worm. But is there really anything to investigate? The small storm in a Wedgwood teacup is being caused by Bill Edwards, the fiancé of Ann Elliott, small town dress-designer and heiress to a family fortune built on the lumber industry. It is assumed that the two would’ve wed by now had it not been for the recent deaths of Ann’s mother and sister. The old lady – well, she was in her fifties – died of heart failure. The sister, Myra, followed a few months later during a Toronto shopping spree. A vain asthmatic with an allergy to just about everything, she was discovered dead in her car smelling of a perfume she'd been advised to avoid. 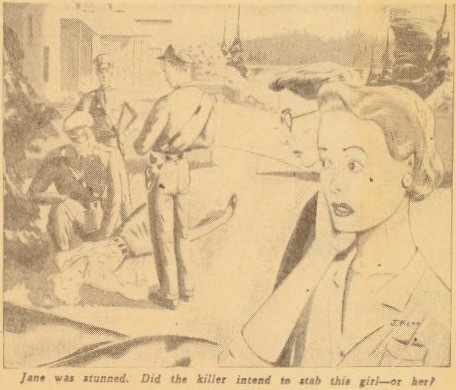 At the time, no one thought anything suspicious about either death, but Bill has begun to suggest that both women were murdered. 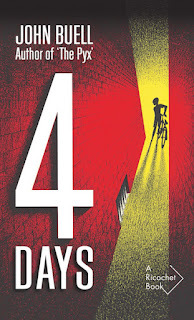 Jane doesn't get much of a chance to do much before the body of a real estate agent named Marina Thorpe is found just outside the gates of the Elliott estate. Jonathan and Henry Lake fly in from Toronto and things get strange. “Nor have I. We are definitely out of bounds. But I think that under the circumstances we could be allowed the latitude. “Well you wouldn’t do no harm,” the sergeant agreed. "What right have you big-shot snooping outsiders got to come here and show up the regular officers?" says the murderer, when caught. "A smart-alecky girl... an armchair thinker with his arm in a fancy black sling, a tin-horned cop with a notebook... and how do you think our Provincial men are going to look, going into court with all the credit going to you?" Good questions. Of course, Jane, Jonathan, and Henry have no right at all. The Provincial men won't look at all good. What's more I'm betting that the evidence Jane and Jonathan collected will be thrown out of court. And so, This Necessary Murder joins Wees's Where is Jenny Now? in being considered and rejected as a Ricochet Book. Next up: M'Lord, I Am Not Guilty. Here's hoping it's better than its title. Bill Edwards, Allie and Danny had gone to Ann Elliott's. Jonathan had called Henry Lake to give him the news of Jed Barnes, and Henry had said at once that he would like to come in and see Jonathan, if suitable replacements could be found for him. There had been two more reporters, he said, and in any case Miss Elliott had been shut up in her room most of the day, alone, and it might be that she would soon waken and wish for company. There had been a special note in his voice that Jonathan recognized. So Allie and Danny had been encouraged to go out there, and Bill had insisted on going too. Trivia: Though Jane is the main character in This Necessary Murder, her name isn't so much as mentioned in jacket copy. More trivia: Ottawa is spelled "Ottowa." I blame the British editor. 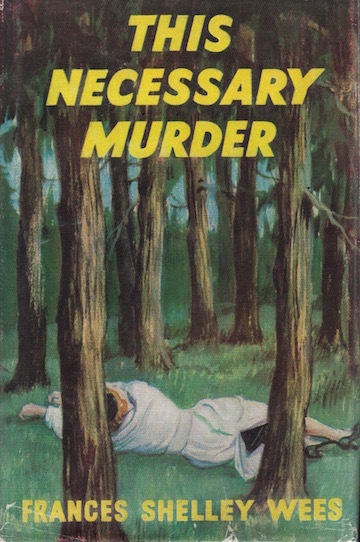 The anonymous hand behind "MURDER IN MUSKOKA" writes that "This Necessary Murder starts out in Toronto and moves to Muskoka" (the novel places Tressady as being north of Toronto, but gives no specific location). 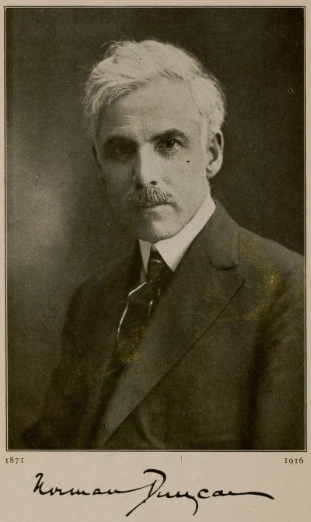 Jonathan Merrill is described as a psychologist who lectures at the University of Toronto (something not mentioned in the novel). According to this same anonymous hand, Wees has confirmed that the Boyd Gang inspired the Barnes Gang (which plays a role only in the backstory). She reveals that Jonathan Merrill is modelled on a "Toronto public relations man (who is in on the secret)." Object and Access: A compact hardcover in pristine dust jacket. The rear flap features an advert for The Keys of My Prison. I purchased my copy of This Necessary Murder from bookseller Stephen Temple this past summer. He was kind enough to knock off a few dollars from the asking price. 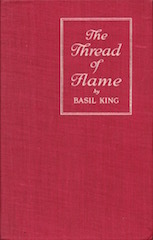 As of this writing one – one – copy is listed for sale online. Jacket-less and ex-library, it's being offered at $17.50 by a Chatham bookseller. It may well be worth the price. 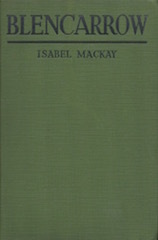 Library and Archives Canada, the University of Calgary, and the University of Victoria have copies. C'est tout. 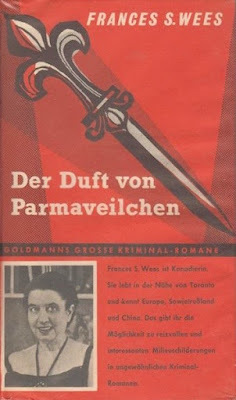 Despite disinterest from the Americans and paperback houses on both sides of the pond, the novel was published in German translation: Der Duft von Permaveilchen (Munich: Goldmann, 1962). A Rival for Margaret Millar? Peace came with a suddenness that has left the world a little breathless. Men of discernment had predicted from the very first that, when Germany once began to crack, the end would follow within a short period. But who was there bold enough at any time before September of the present year to stand out and say that the break-up would have come before the New Year? 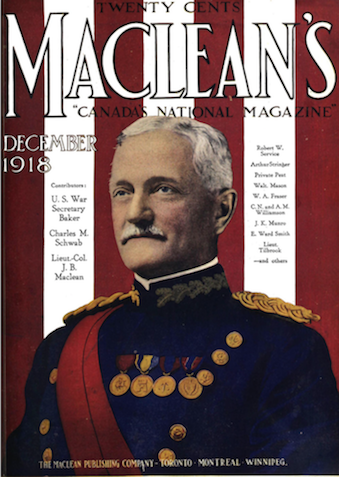 "Now That the War is Won" by Lieut-Col J.B. Maclean, is the only article that looks to have been commissioned après la guerre. And it's very short. 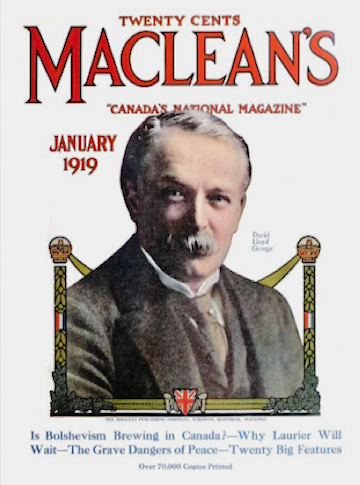 Other articles include "An Unsolved Mystery: A Story of Warfare Under the Earth" by Lieut C. W. Tilbrook and an interview with the U.S. Secretary of War conducted by Pvt Harold R. Peat (Mrs Peat has an article of her own in the "Women and Their Work" section). Fiction fairly dominates the issue, with short stories and serialized novels by W. Victor Cook, W.A. Fraser, Allan C. Shore, Arthur Stringer and Alice Muriel Williamson. 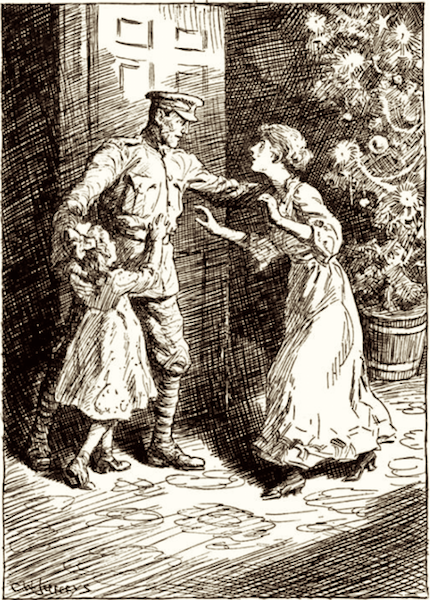 Sadly, Shore's "Santa Clause in Petticoats" isn't nearly as titillating as its title, but Stringer's story is fantastic. To help her with her Christmastree." Of Christmas bells—and where is he? And how the house is dark and still! And Annie’s sobbing on my knee. Leapt at me. . . Oh! my heart was stilled! Unto its hateful heading: KILLED. "And will he not be long?" she said. Till wearied out, she stole to bed. Alone I decked the Christmas tree. And in the street I heard them call. A Victory! What care I now? A thousand victories were vain. And have my man, my again. Their pomp and power beyond the sea? Could that bring back my dead to me. "But come, my dear; we will not wait. Each tiny candle pink and white. And we must ave all gay and bright." "'Oh, Father dear, protect and bless. . . Protect and bless. . .'"
What’s that? A step upon the stair! A rush! The door thrown open wide! And Annie’s laughing by his side. . . I'm in his arms. . . I faint. . . I faint. . .
"Oh, God! Thy world is glorified." NOTE.—The author wishes it understood that the sentiments expressed with reference to duty and the war are to be taken as an uncontrollable outburst in the first moments of bereavement, and not as in any sense an expression of opinion. To help her with her Christmas-tree." Of Christmas bells, and where is he? And Annie’s sobbing on my knee! Till tired out she went to bed. A victory. . . . Ah! what care I? A thousand victories are vain. And have my man with me again. What mean such words as these to me? What matters it to us poor folk? Who win or lose, it’s we who pay. Aye, so a million women say. "Hush, Annie dear, don’t sorrow so." Each little candle pink and white." A shout! – the door thrown open wide! My hero and my man is there. And Annie’s leaping by his side. . . The room reels round, I faint, I fall. . .
"O God! Thy world is glorified." The original is better, don't you think? 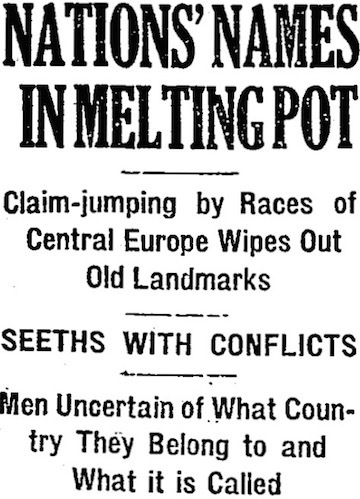 The note's disappearance speaks volumes to the differences between wartime and peacetime.